A conditioner with a gentle finish. That will deeply moisturize and strenghten the hair and furthermore, add the finishing touch of shine and softness. Benefits all hair types. Colour safe. Made in Canada with Certified Organic Herbal Extracts. Paraben, Sulphate, and Synthetic Fragrance Free without the use of harmful substitutes. Very nice, mild, really unscented, rinses out easily. This conditioner isn't as awful as the shampoo but it didn't really do anything for my hair and I do appreciate the company's bulk options to reduce plastic waste but I'm not paying money for a product that doesn't do anything for my hair. Great product. One of the best fragrance free options Iâ€™ve tried. Good price. Will probably be my go-to from now on. Works well, and I love that it is unscented. I am very sensitive to scent and this is perfect. I have stocked up for me and my kids. Light and doesnâ€™t leave buildup. Leaves my thick curly hair feeling nice and smooth and easy to manage. I have only used this once, honestly, with my thin, long, dirty blonde hair the shampoo is great and needs no conditioner! I just bought this conditioner again and I noticed a faint fragrance with it that I didn't notice the first time I purchased it. I still love it, and am relieved I still don't react to it. I would definitely still continue to use. Nice light, environmentally friendly conditioner; leaves your hair soft and shiny, will buy again. I am very happy to have found Oneka! I have had trouble finding a chemical free, unscented product line that didn't cause a reaction! I have chemical sensitivities and even some natural ingredients/essential oils bother me and even if products state unscented, a faint fragrance may linger...but not with this! I had no sensory or skin reactions at all, what a relief! I am so thankful to have found this shampoo and conditioner, it's been very difficult for me and i'm now looking forward to trying their other unscented products!! Thank you! I love this conditioner! 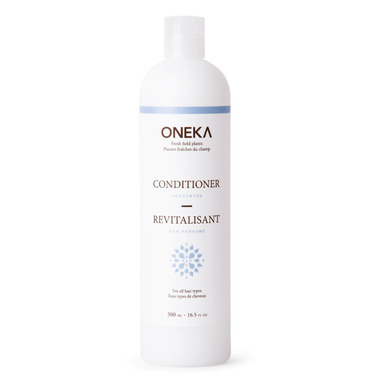 I am allergic to preservatives in products and no reactions with this conditioner. It leaves my hair tangle-free and soft. This is my 2nd bottle purchase and will not be my last! I have a sensitivity to fragrances and this is one of the very few conditioners that doesn't cause any irritation and doesn't make my hair feel strange. It's a nice light conditioner. Has a wonderful effect on the hair - my hair is shinier & calmer (it's naturally curly/frizzy), although this product is not very effective as a detangler. This is a very gentle and pleasantly scented (though unscented) conditioner. It isn't incredibly moisturizing (my hair doesn't need heavy moisture, though others might) but my hair feels very light and soft and this conditioner does for me what I really need. I have nothing negative to say about it. I like that it comes in such a generous size. Great for light conditioning and detangling, and doesn't weigh hair down. The best part is that it's completely unscented. Plus, it's a Canadian company! Once again same as shampoo. Excellent product for anyone with chemical and scent problems. Works greats! Pretty good conditioner and totally unscented. A little bit expensive for the amount you get, but not bad when you look at the cost of other unscented items.